'How Does It Feel?' 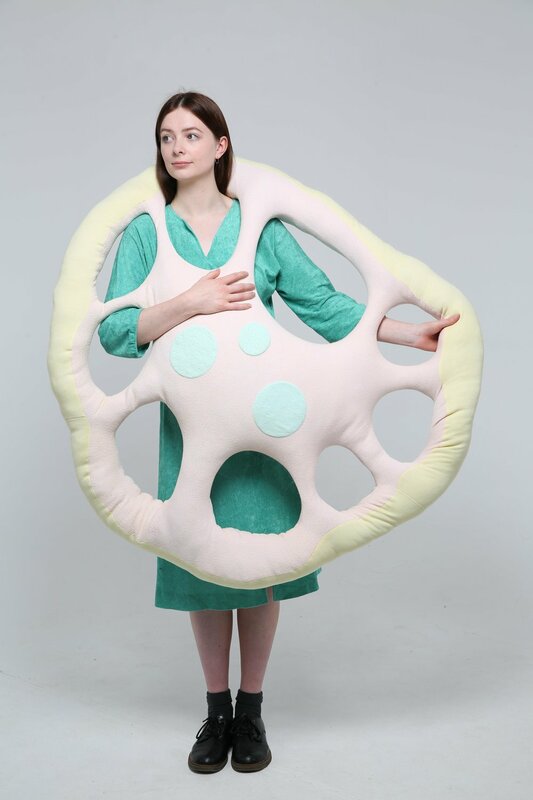 is an interactive and wearable textile cushion that explores the unique relationship individuals with Autism have with their sensory environment. The piece is hand dyed and screen-printed and has been constructed to create a tactile, stimulating experience for those on the Autistic spectrum. With 'How Does It Feel?' the viewer/participant of the work is encouraged to interact with the work in any way they like, it can be worn, sat on/under, interacted with multiple people at once. The work aims to be a playful device to encourage the development of spacial awareness whilst also encouraging a positive play experience. Through interaction with the work, sensory interaction is encouraged along with the opportunity to develop communication skills through play. For so many individuals with Autism, their senses can be a gateway to experience and expression and 'How Does It Feel?' aims to highlight this. As a sibling of an individual with Autism, and as a service practitioner for a charity that focuses on needs-led and sensory experiences, I really believe that using art and design in a participatory setting has the ability to enhance meaningful, creative experiences for both children and adults.